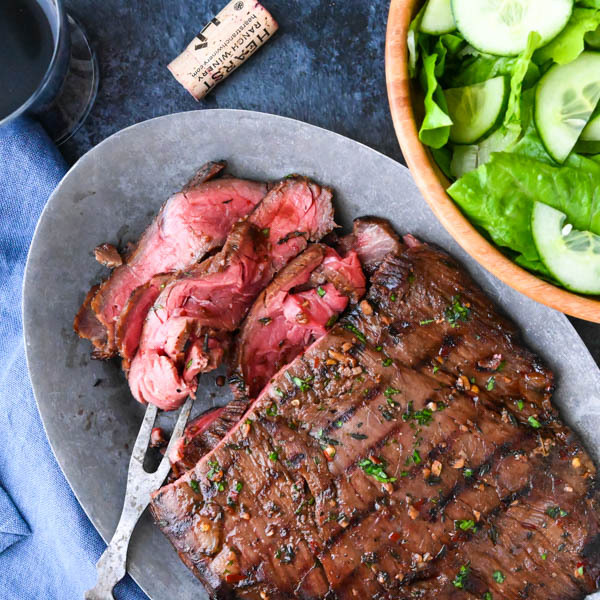 This easy flank steak recipe uses a boozy bourbon steak marinade for tender, flavorful results every time. 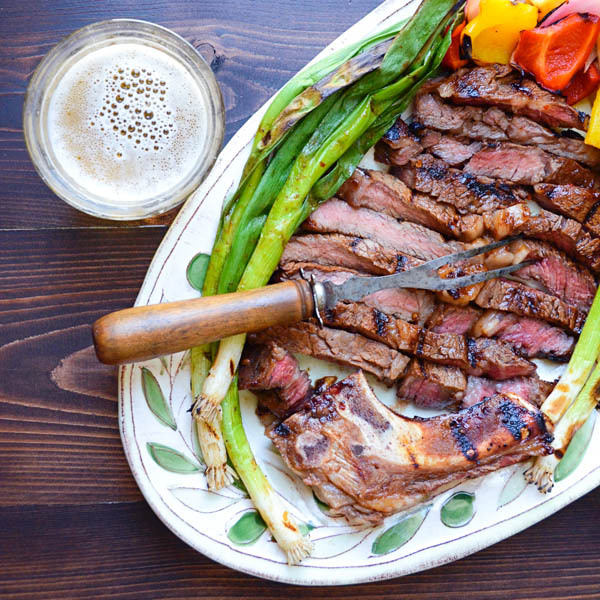 The marinade for this bourbon steak recipe is ready in about 5 minutes. 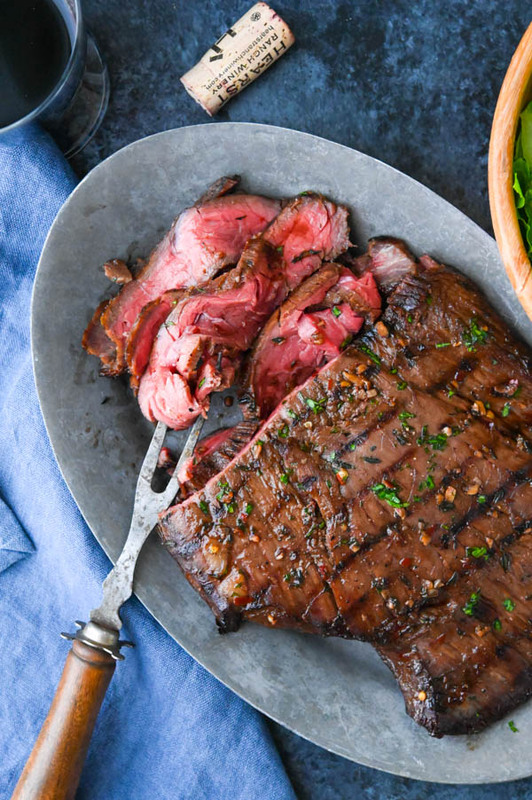 Just let the beef soak for at least an hour or up to a day for a marinated grilled flank steak your whole family will love. This post has been updated for photos and article since it’s original publication in 2014. My grandmother, Myne, shared this easy flank steak recipe with me years ago in a “recipe book” that she wrote out by hand. In it, were all of the recipes I’d grown up with like her Northern Neck crab cakes, espresso fudge sauce and homemade peach blueberry pie. She gave me the book as a Christmas present one year and I return to it often for many of my favorites, including this bourbon steak marinade, which came from my Great Aunt Betty. Once you’ve mixed the marinade together, take a whiff! It smells amazing and the longer you let the steak marinate, soaking up those sweet, salty, umami flavors, the more intense they’ll be. 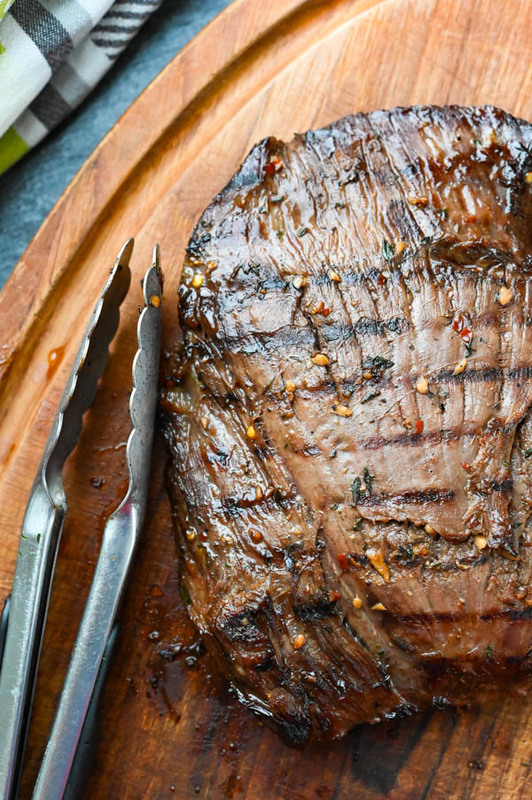 Cook the bourbon marinated grilled flank steak to your desired doneness. For medium rare that’s usually 5-8 minutes per side, depending on the size and thickness of your steak. If you’re a grilling aficionado, you know all about the “touch test” that will give you a good approximation of when you’ve achieved your desired doneness, but for a more accurate measure, use an instant read thermometer. After removing the grilled marinated flank steak from the hot grill to a cutting board, let it rest. I know it’s hard to resist, but if you start slicing right away, the juices within the meat will run out and you’ll lose much of the moisture that makes the steak taste tender, juicy and flavorful. About a five to six minute resting time is perfect for the juices to redistribute throughout the beef. 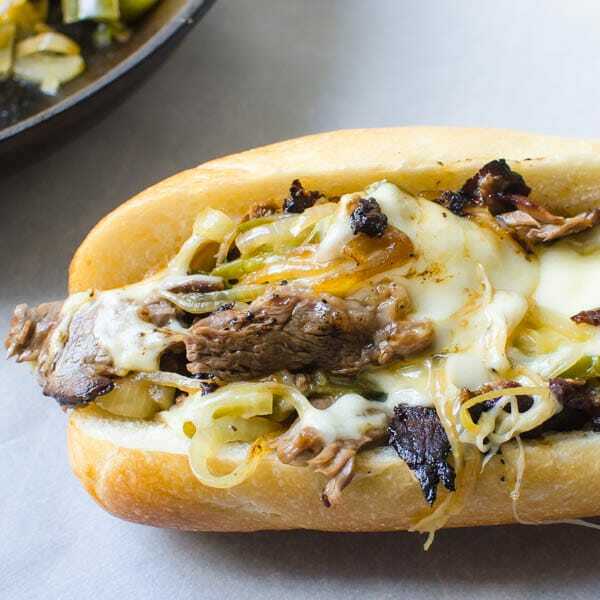 Didn’t I tell you this was an easy flank steak recipe? Feel free to use the bourbon steak marinade on other cuts as well. It would be great on a rib-eye, skirt steak, sirloin, porterhouse, London broil or New York strip. 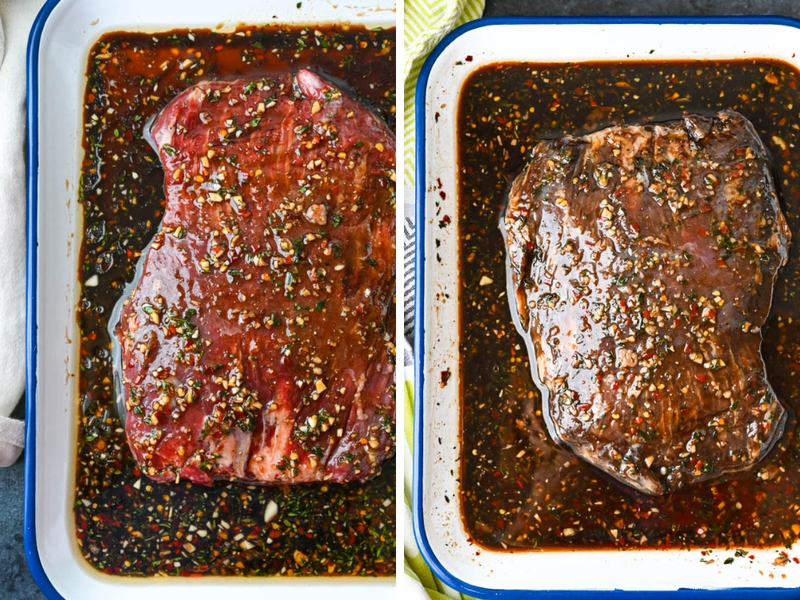 One of the easiest and most flavorful marinades for steak EVER! Despite the soy sauce, this is not an Asian dish -- the bourbon and brown sugar, shine through! In a small bowl or glass measuring cup, combine the brown sugar, bourbon, olive oil, soy sauce, thyme, garlic, pepper and red pepper flakes. Whisk to combine. Place the steak into a rimmed pan and cover the steak with the bourbon steak marinade. Wrap loosely with plastic wrap and refrigerate, flipping occasionally to ensure uniform marinating. Conversely, you can use a resealable plastic zip top bag, place the steak and marinade in the bag and squeeze out as much air as possible before sealing it. Flip the steak around a few times to coat it with the marinade. Heat barbecue to a medium high heat, about 450°. 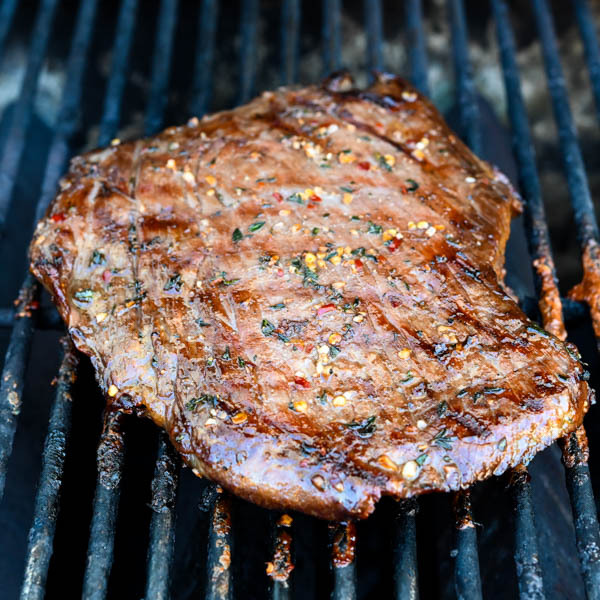 Remove steak from marinade and blot off the excess moisture with a paper towel. Place steak on hot grill. Cook for 5-6 minutes on the first side for medium rare. Flip the steak and cook an additional 5-6 minutes. Transfer steak to a cutting board and allow it to rest for 5 minutes so that the juices redistribute throughout the meat. Slice the flank steak thinly, against the grain and serve. Cooking times depend on the size of your steak, and your preference on doneness. We like ours medium rare. 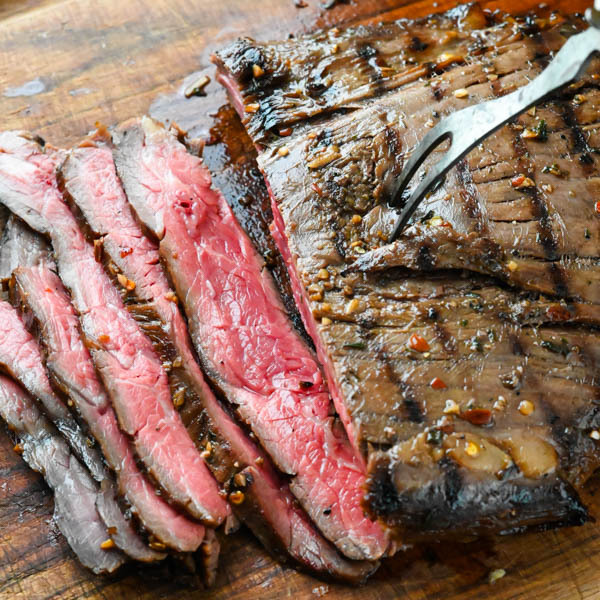 Pin “Bourbon Marinated Grilled Flank Steak” For Later! I love bourbon! Great idea for a marinade! This needs to happen soon for dinner! Looks so delicious! I saw this on Instagram and was immediately drooling – it looks and sounds so flavorful! Can’t wait to try it. Just pinned this to my “Amazing Meat Recipes” board. That marinade seriously sounds and looks so over-the-top delicious! Beautiful photos too! This sounds amazing! This marinade sounds so tasty. Just did a variation of this with Jameson. Came out awesome! THANKS! We tried this marinade on some round steak (London broil) yesterday and it turned out outstanding. Due to time constraints and not having the proper ingredients on hand, I used a Canadian whiskey, minced garlic, Tuscan style Italian seasoning and low sodium soy sauce. I can’t wait to try it with the real list of fresh herbs and bourbon. Thanks for the inspiration to try something different. That sounds like a tasty marinade! 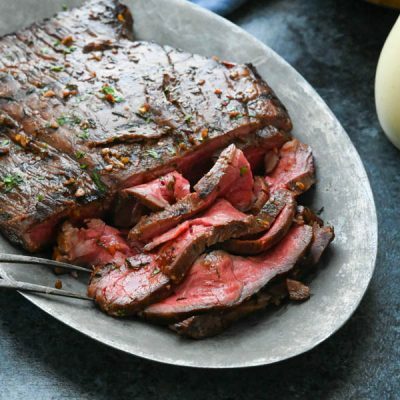 London broil is one of my favorites! Flank steak is one of my favorites. Thank you for a new marinade recipe. I will try! 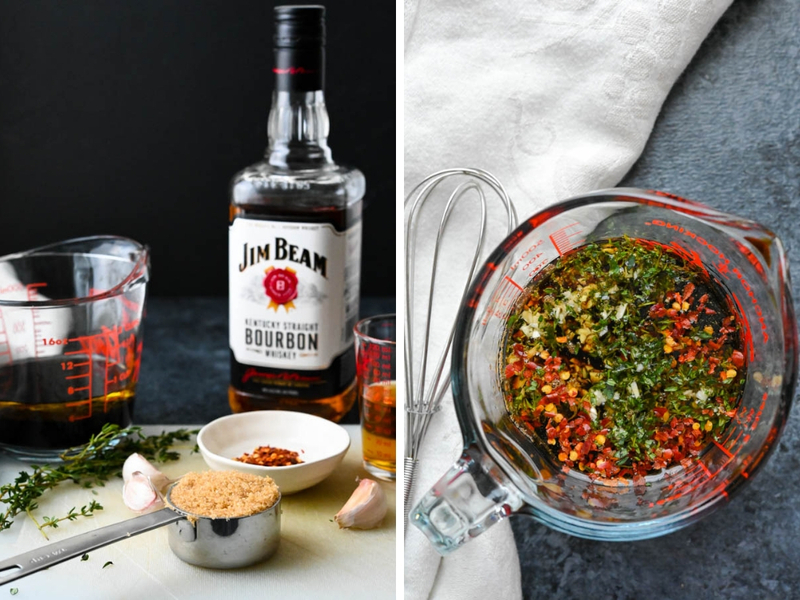 This has been our go-to flank steak marinade for years. The recipe starts out with “In a small bowl, mix the first 8 ingredients.” but there seem to be only 8 ingredients listed. Were there any ingredients missed? Thanks for the catch! No ingredients missed, just can’t count!